Fall Lacrosse League/Training | Broward Lacrosse Advantage, Inc.
Below is a summary of our two separate programs. We recommend players participate in both programs as they are on different days. Players who register for both will receive a discount from the combined fees. Our team and position coaches are highly experienced players with coaching knowledge and tons of high level skills. Through our many training programs these coaches are the best at teaching young players how to get better. We love to coach and it shows on the field. Players will be divided up into teams within each age group and assigned a college experienced lacrosse coach. The first weeknight practices will consist of a 1 hour practice with their team followed by a 1 hour lacrosse game with officials. The second weeknight will be a 1 hour game only. The games will be 7v7 format (2,2,2 goal). Standings will be kept online and playoffs will be held the last two games. Fall Ball Champions will be crowned at each division. We are targeting 4 or more teams of 10-12 players at each age group. Divisions may be changed slightly to fit the registration groups. Fall Position Training is designed to arm participants with effective position-specific lacrosse skills and techniques and to significantly upgrade their situational lacrosse knowledge (also known as lacrosse IQ). Players will be split up by age group and position. Expert coaches will demonstrate position-specific skills, teach the players the keys for success on each, and run the players through fast-paced drills to ensure mastery of the skill. Coaches will also educate players on the appropriate in-game situation to use each skill. Players will be challenged to effectively use the skills and communicate the key success points to their peers, coaches and parents. Players will be evaluated by their coach at the end of the program on their mastery of the various skills that were taught. Accountability and expectations will be high in this program. We will expect players to work on the skills taught outside of the 2 hour practice. This is for serious lacrosse players who want to get significantly better. Position training is not currently offered for high school players but we would consider doing so if there is enough interest. *Middle School and High School players can register as a team. 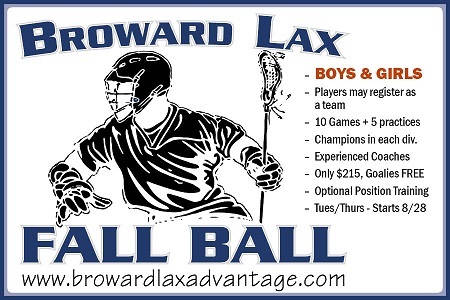 Please email pete@browardlaxadvantage.com to coordinate. - This program is for experienced players. Players must have played at least one lacrosse season (Spring, summer or fall) with a recognized program. New players can qualify for Fall Game League or Position Training by completing a Level 1 Fast Start Clinic. Players MAY qualify with private instruction at the discretion of the directors. - Players must be current members of US Lacrosse (through 9/30/18). Players can update or register with US Lacrosse through our registration page. - There are NO TRYOUTS or tryout fees. All EXPERIENCED players can play in our Fall Game League or Position Training programs.